I remember visiting the home of a friend of mine in elementary school. She was of Indian descent and her home was decorated very ornately with pictures of various gods, goddesses and other colorful images. There was also music playing that I had never heard, it definitely was not the Bruce Springsteen or Bryan Adams that I was used to. I had never seen anything like this before, and like a lot of new things I was interested in it, but also a little afraid. Looking back on this experience, which stands out vividly in my memory, it reminds me that just because something is different or you initially react with fear or apprehension it doesn’t mean that it is not beautiful. When first presented with the music that came along with some yoga classes or meditations I thought, “what the heck is this weird music?” I was not enjoying it nor did it help me relax in any way. It was different and “weird”, and I wanted nothing to do with it. These days I have found myself enjoying the sounds of some of this music. Not all of it appeals to me of course, like any genre of music, but I have especially warmed up to a type of music called kirtan. Kirtan means “to repeat” in Sanskrit, and the music played by various instruments is accompanied by chants or mantras repeated over and over again, often with increasing speed. Coming from India, Kirtan is used as a method to quiet the mind. 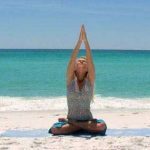 The ancient mantras that are chanted are said to evoke healing energies which help us bring ourselves back to our center, taking us out of our heads and into our hearts. Kirtans, gatherings of people to participate in this collective musical experience can offer an extremely unique and amazing experience. People report feeling a buzz or a sense of connectedness and peace during the chants. It is rare that people in any given space are all on the same wave-length and vibration. 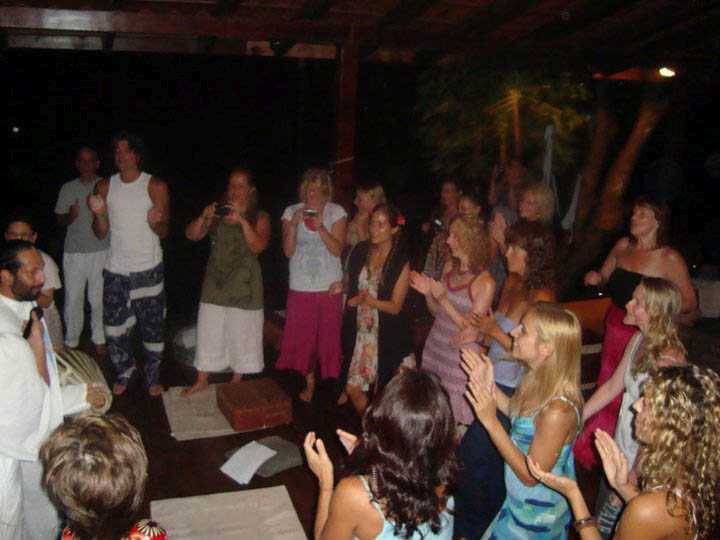 During a kirtan everyone is breathing and resonating at the same time, which creates a wonderful energetic experience. My favorite Kirtan artist so far is Wade Imre Morrisette, the twin brother to fellow Canadian Alanis Morrisette . His music has more of an Indie rock feel (my favorite genre), but includes the chanting and mantras associated with Kirtan. I enjoy his music along with other artists’ during my personal practice, and also when I teach. (I am not teaching this week, as we are hosting a yoga teacher training here at Anamaya, and we actually hosted a kirtan event on May 18, which included music and some AMAZING food. It was a fabulous time full of love and warmth). It’s interesting to research the different mantras that are sung to find out their meanings. The one that resonates most with me right now is “om namah shivaya” which basically means, “I bow to Shiva”. Shiva being your higher self, your true being and highest consciousness. I encourage you to check out some great kirtan music online, here is a great video of a kirtan lead by Krishna Das, a very popular musician in the kirtan community. You did WHAT at yoga? !